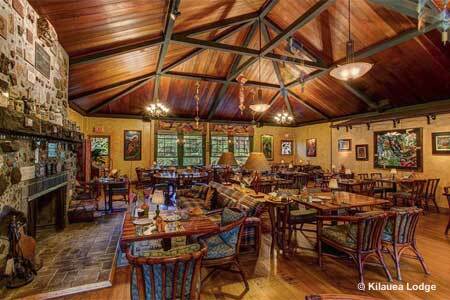 This classy restaurant in an old Hawaii lodge blends Continental cooking with distinct European influences and a local touch. : When mists and chilly rains settle around Volcano, elevation 4,000 feet, the couches around the fireplace of this classy restaurant quickly fill up. In 1938, when the old Hawaii structure was a YMCA, 32 Pacific Rim countries shipped rocks to erect the hearth as a Fireplace of Friendship. It survived major renovations in 1986, when Lorna and Albert Jeyte transformed the building into a friendly upscale chalet-like lodge. Polished wooden floors echo when you walk on them; walls are broken by plantation-style small-paned windows. The meals blend Continental cooking with distinct European influences and a local touch. We love the creative use of coconut flakes with the herbed, baked Brie. More traditional entrées include hasenpfeffer (braised rabbit in a hearty wine sauce), apricot- and mustard-glazed duck and, of course, the fresh catch. Or try the German sausage plate or the sliced prime rib stuffed with mushrooms, herbs and cheese. All entrées come with soup or salad. Save room for the famous bread pudding.